Dozens of Rabbis in Israel, who are known as Kabbalists (mekubalim), function in Israel. They are involved in giving blessings for success, providing personal or business advice, and mediating between businessmen. Remuneration given for these services is generally considered as a donation to the Kabbalist, for which they are not required to pay any taxes. In the public debate about the appropriateness of this tax exemption, much of the blame is directed at the Kabbalists. This position paper discloses how the Israel Tax Authority has discussed this issue for more than a decade, and has still not succeeded in formulating a uniform policy which is enforced. From 2004, the Israel Tax Authority and the Ministry of Justice have repeatedly advocated that Kabbalists’ income should be taxed. Two formal opinions to this effect have been promulgated, one by Attorney General Elyakim Rubinstein in June 2004 and the other by his successor, Meni Mazuz, in March 2005. Neither was implemented. Only in August 2008 did the Israel Tax Authority start moving in this matter, but in 2014 the State Comptroller held that this effort was highly inadequate, nd that the system was not mobilized to effectively tax the Kabbalists.” In addition, various statements by the State Attorney General in court, claiming that the matter was close to fruition have not proven accurate. The need to tax the Kabbalists was once again raised in the State Comptroller’s report of October 2014. The State Comptroller also pointed out that hundreds of millions of Shekels are paid to these Kabbalists without any taxation and that there are well-founded concerns that some of these payments are being used to launder the funds. The Comptroller also found that the Taxation Authority not consistent in its enforcement efforts regarding certain Kabbalists. 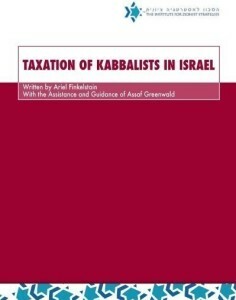 Based on the State Attorney’s report, we assert in this position paper that the main reason for not taxing the Kabbalists lies in the fact that the Taxation Authority has not been able to formulate a clear-cut policy regarding this unique type of income. This position paper shows that, despite the State Comptroller’s recommendation to set a specific policy for this issue, the memorandum draft issued by the Taxation Authority in June 2015 did not achieve this goal, and it persists in applying the current blurred and hazy policy, which will most probably lead to a situation where no consistent and effective taxation of the Kabbalists will be implemented. We conclude, therefore, that this tax irregularity can be corrected only by legislation in the Knesset; that reform by regulation simply will not happen. Accordingly, the policy proposed in this position paper, supported by representatives of the State Comptroller’s Office and of the Taxation Authority, is to define by law that gifts received by a person from a non-family member shall be deemed income and must therefore, be taxed in the same manner as all income.